Two of my absolute favorite fruits of the summer season are peaches and cantaloupes, and I mostly enjoy them just cut and sliced in their natural state. 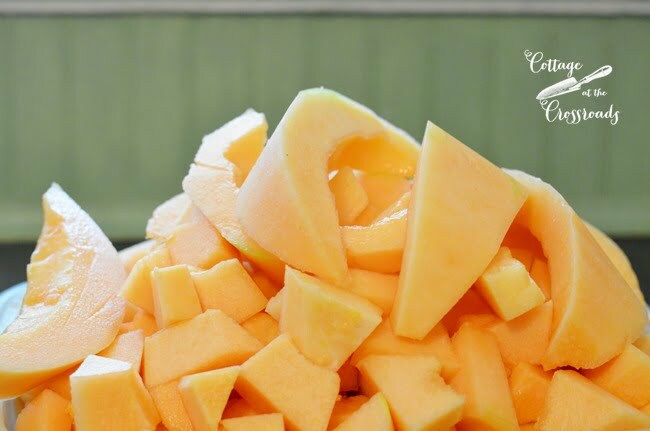 But when you have an abundance of sweet cantaloupes from the garden, you start thinking about how you can capture that flavor in another form. 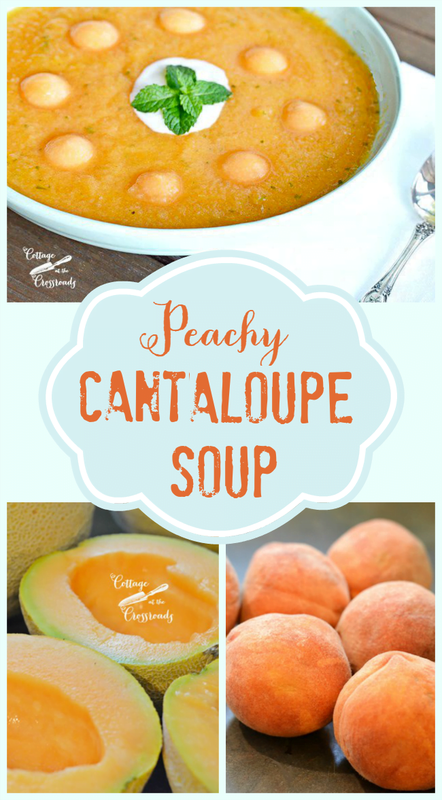 So today I have a refreshing, cold peachy cantaloupe soup recipe for you that would be a perfect beginning for summertime dinner or a light main dish for a brunch. The star of this soup is, of course, the cantaloupes. 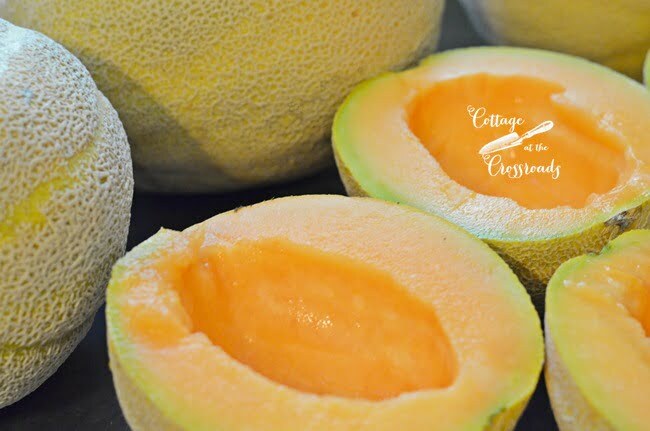 We have been blessed with an abundance of them this year, and they have been the sweetest cantaloupes that I have ever tasted. If you look closely, you can see 5 of them growing side by side. Sometimes I’m asked how do I know when they are ripe for picking. Here’s what works for me. I gently nudge on the stem with my finger, and if the cantaloupe is “ready to leave the vine,” it will come off easily. 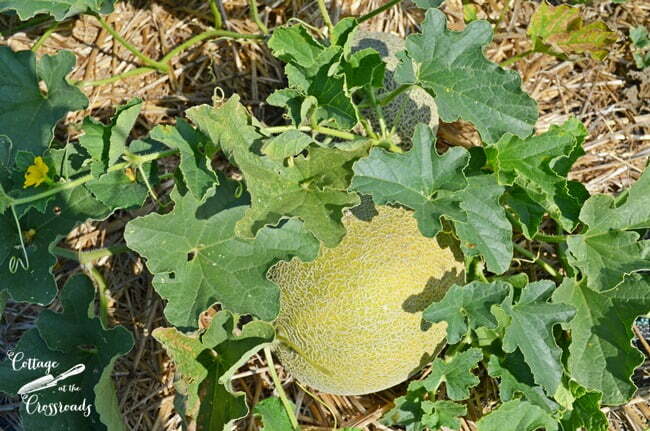 If you are selecting a cantaloupe from a store of a farmer’s market, you can only tell if it’s ripe by the smell. Just pick it up and sniff. It will have a fresh, fruity smell if it’s ripe, and if it doesn’t, leave it! 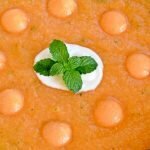 Now, I’ve had chilled cantaloupe soup before and it’s good, but the secret to this refreshing soup is the peaches. Living in South Carolina, we have access to an endless supply of peaches. Georgia is known as the peach state, but our state actually produces more. We do have a peach tree in our yard but we have never gotten any peaches from it! But a huge peach farm is located not too far away and this is where we purchase our peaches. 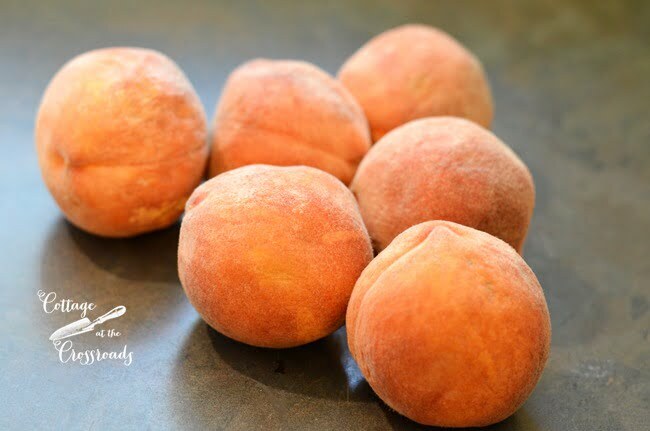 For this recipe, you will need 4 or 5 medium sized ripe peaches. Peel them, remove the pit, and cut them into chunks. Puree them in a blender or food processor and pour into a large mixing bowl. You will also need 2 medium sized cantaloupes. Cut them in half, scoop out the seeds, cut into slices, and then remove the peel. Cut the slices into chunks and puree them in a blender or food processor. You will probably need to do this in two batches. Add the pureed cantaloupe to the bowl with the pureed peaches. When you’re doing the second batch of cantaloupe, throw in about 4-5 leaves of fresh basil and about 4 fresh mint leaves. And add in some grated fresh ginger. Don’t skip this step! The ginger gives the soup another layer of flavor. Would you believe the grocery store that I went to did not have any ginger root??? 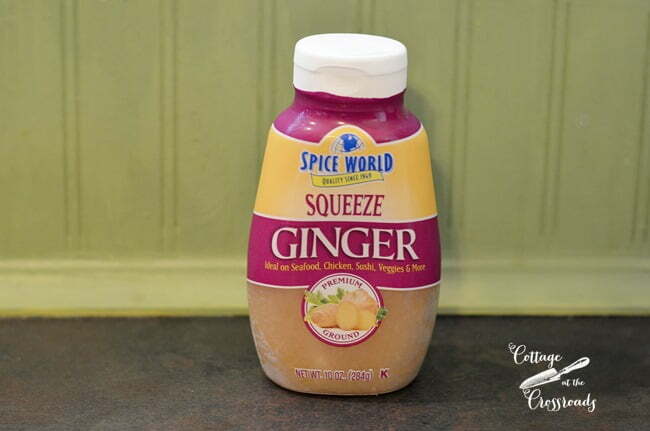 But I did find this squeeze ginger which was a fair substitute. Fresh is always better! And lastly, add in the juice of 1 whole lime to the soup and stir to blend thoroughly. At this point, cover the bowl and put it in the refrigerator for at least 3 hours before serving. Before serving do a final taste test to see if you need to add some sugar or honey, depending on the sweetness of the melon. And immediately before serving, add some fizz to the soup by pouring in about 6 ounces of sparkling wine, sparkling flavored water, or white grape juice. 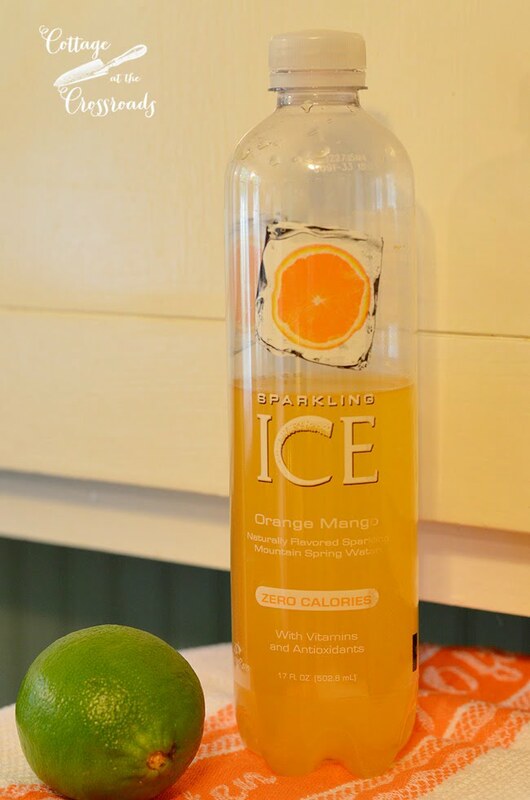 I used this orange-mango flavored sparkling water in mine. 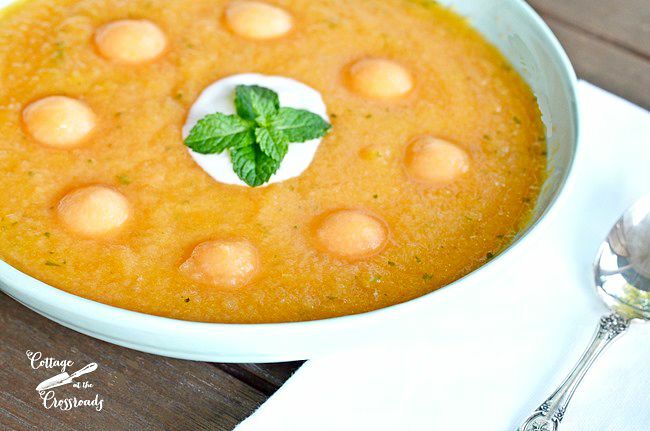 Mix thoroughly and ladle the soup into shallow bowls.Garnish with a dollop of vanilla yogurt, a sprig of fresh mint, and some cute, little melon balls. I think it’s just peachy that you can have all this wonderful flavor without heating up the kitchen! A refreshing chilled soup that captures the flavors of summer. 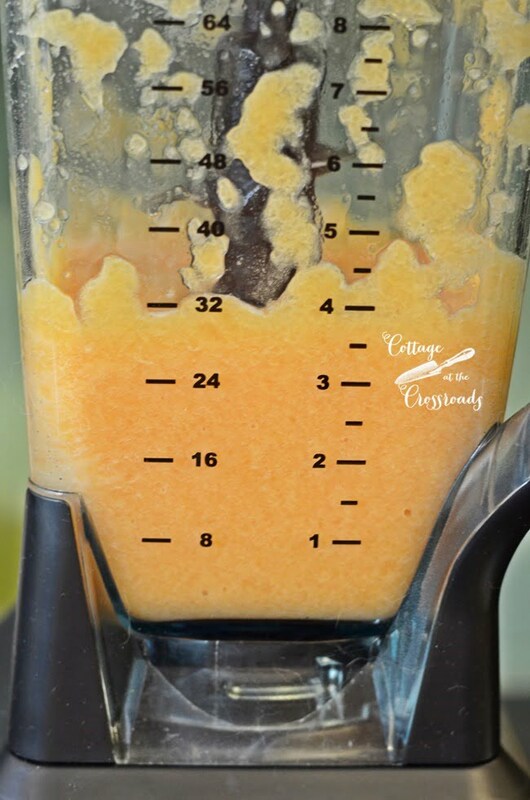 Using a food processor or blender, puree peaches and pour into a large mixing bowl. 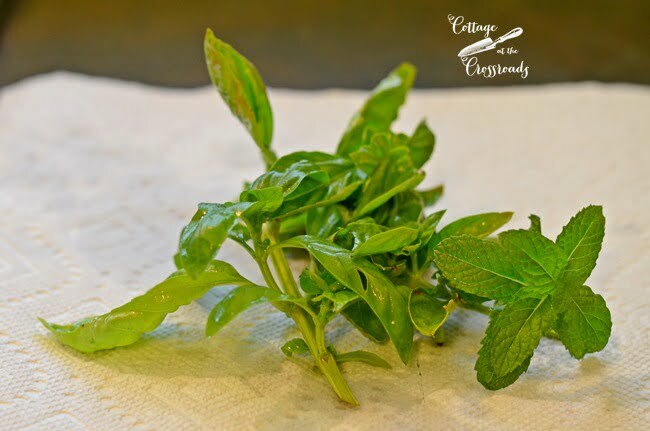 Using a food processor or blender, puree cantaloupe in two batches, adding the basil and mint leaves into one of the batches. Pour the pureed cantaloupe into the bowl with the pureed peaches. Add the juice of 1 lime and 1 tablespoon of fresh, grated ginger and mix thoroughly. Cover the bowl and refrigerate at least 3 hours. Before serving, taste the soup to see if any additional sugar or honey needs to be added. Pour in 6 ounces of flavored sparkling water, white grape juice, or sparkling white wine. Mix thoroughly and ladle into shallow bowls. Garnish each bowl with a dollop of vanilla yogurt, small melon balls, and a sprig of mint. Your soup looks delicious Jane and is perfect for this sweltering weather! I love the addition of the fizzy flavored water! Oh, yes, sweltering is a good word to describe our weather right now, Mary! This looks delish – love the new format of your blog! This recipe sounds interesting. Question? Is the soup texture fury as in a split pea soup or is this smooth? 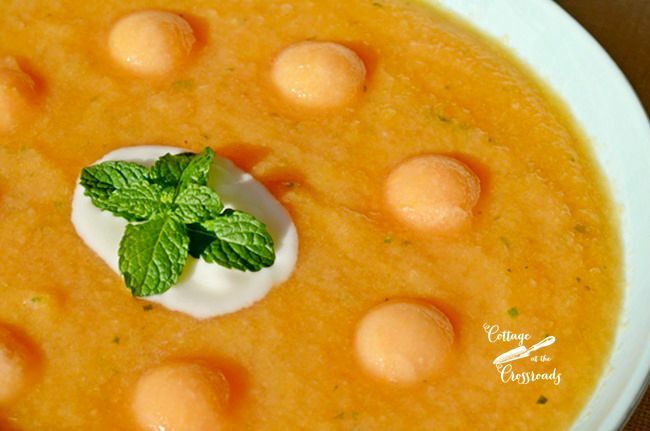 Sherry, the texture of the soup is very similar to a smoothie because of all the juice that comes out of the peaches and the cantaloupe. It is not thick at all, especially when you add the additional sparking water or wine. Jane I have never heard of such a soup, but it sounds delicious and luck you to be overflowing with the ingredients. Yes, we are very fortunate to walk outside and gather a “sack of groceries!” Leo has a very funny story about the first time he encountered a cold soup in a restaurant! Yum Jane and how great to be able to have the ingredients so fresh right off your property. Looks so good. Kris, we never take that for granted. It’s hard work to have a large garden but the rewards are tremendous. 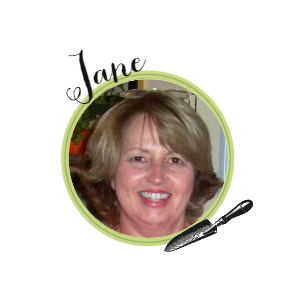 This sounds divine Jane, I wish I could go outside and just pick a sweet cantaloupe! 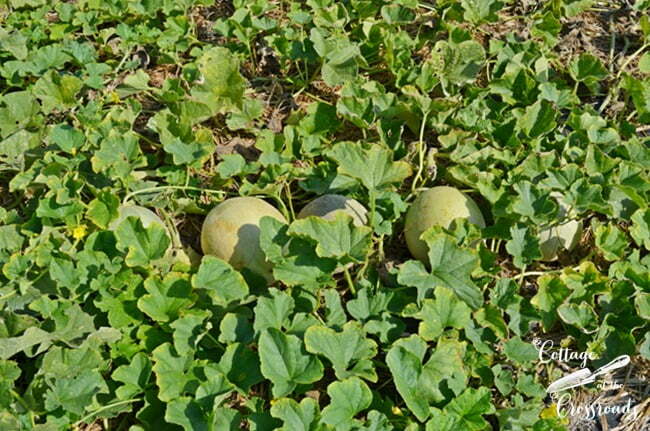 This is the best crop of cantaloupe that we’ve had. All of them have been so sweet this year, Jenna!